I literally cannot say the words “back to school” without thinking of Adam Sandler in “Billy Madison”. I didn’t pack a lunch, I didn’t wear boots & certainly didn’t get in a fight but I DID have my first class of the semester today. The day didn’t exactly start out like I had hoped it would. I wanted to get up nice & early to allow myself time for a good breakfast before heading off to class, followed by a few hours at work. I didn’t have any makings for a good breakfast. No eggs, no fruit, no veggies. I stopped to get gas on my way to school. While pumping gas, it occurred to me that I had neglected to put on deodorant. I stopped at Panera for an iced Chai. I entered the parking ramp at school incorrectly (aka, into the section for handicapped & private parking, with no access to general parking), had to take a right onto a one way & wasn’t able to get back into the ramp the right way. I parked on the street. While plugging the meter, I dropped my Chai. 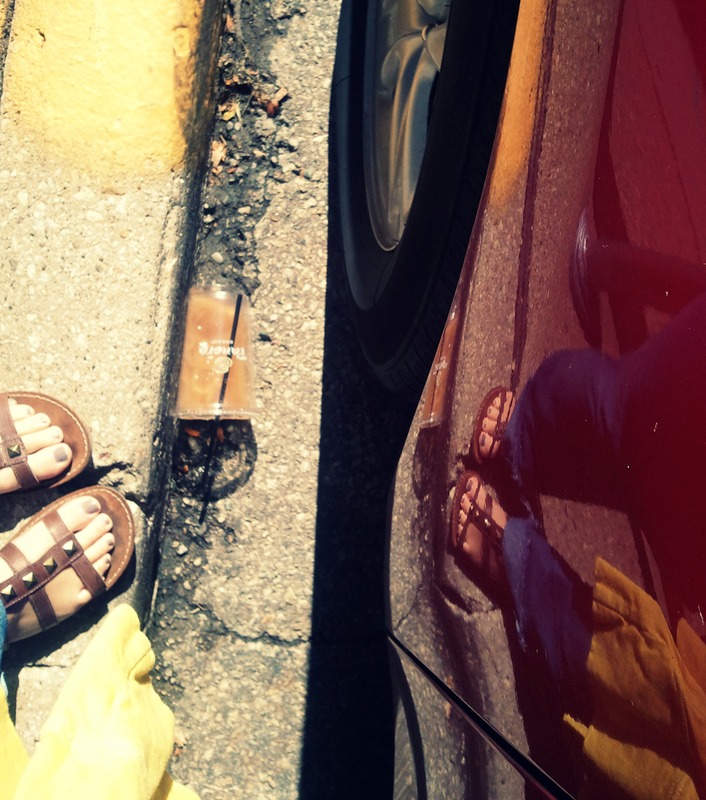 Sweet, creamy, cold Chai poured out of my now damaged cup & onto the street. I walked into class 2 minutes late. I had to sit in the very center of the classroom. I walked to that oh-so-undesirable seat with every eye in the classroom on me. Me: “Nope, I’m just late.” I got a few chuckles at least. The rest of class went fine and the day started looking up. I trained a new girl at work & then headed to the grocery store. Yesterday was dreary & rainy. It had me in the mood for soup. We let Chili’s do the work in the form of baked potato soup to-go last night but I needed to make soup today, despite the 90 degree weather & sunshine. It was fantastic. I decided to retire to the couch for the evening after dinner so I could be sure to end the day on a good note. I even let hubby wash the dishes. Didn’t want to take the chance of breaking anything, ya know? I started with roasting three ears of sweet corn and a red pepper. Admittedly, I did not roast these long enough. The tassels on the corn started on fire, I got scared, & took it all off of the grill. Because I didn’t roast the pepper long enough, the skin didn’t “just peel right off” like it does in the cooking shows. I left it on. I took craptastic photos. But believe me, this stuff is G-double O-D good (yep yep yep). 1. 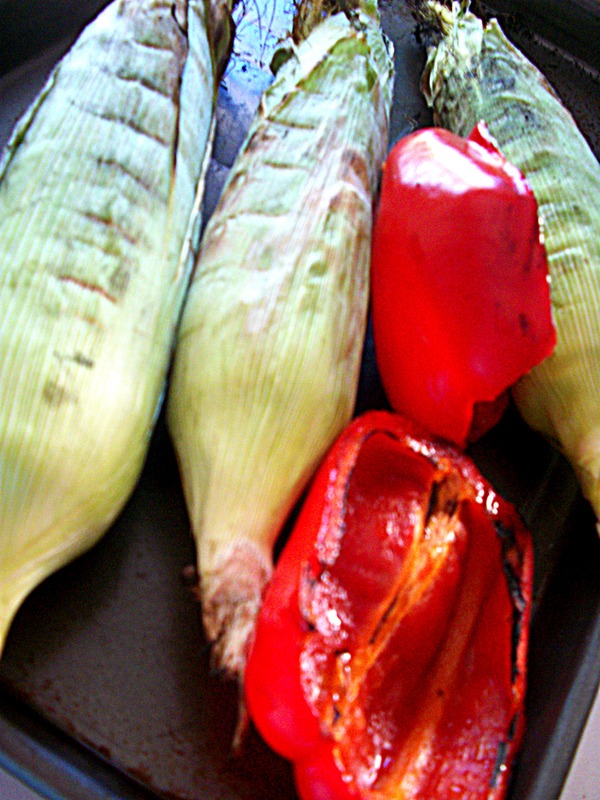 Roast corn & pepper. Cut corn off cob, dice pepper. Chop onion & potato. 2. Melt butter in large stock pot over medium heat. Add onion, allow to cook for 2-3 minutes. Add mushrooms. Allow to cook for 2-3 minutes more, stirring occasionally. 3. Stir in flour. Gradually add milk & broth, whisking to combine flour with liquid. 4. Add potato, pepper, corn & seasoning and bring to a boil. 5. Stir in chicken & green onion. Cover, reduce heat & allow to simmer for 15 minutes. 6. Garnish with more green onion & enjoy! Here’s hoping my next day of class goes a little more smoothly or it could be a loooong semester. Do you ever have a day where everything just seems to go a little wrong? I know things could have gone way worse today, but I couldn’t help but chuckle at my little “issues” all day. 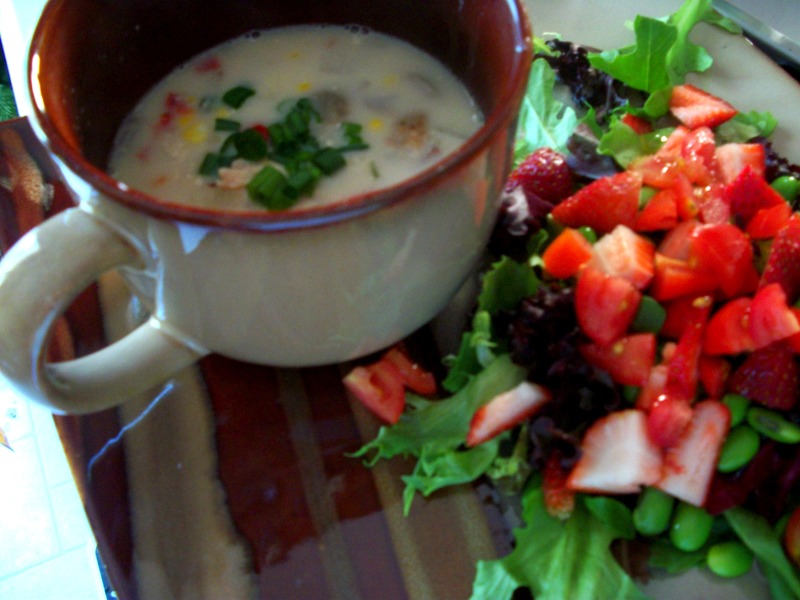 That chowder recipe sounds perfect for a nice fall day. I def need to make that at my next football gathering!